Austrian born drum Thomas Lang is not only an extremely talented drummer, but also a talented musician. Thomas is best known for playing in over 250 albums, as well as creating a number of instructional DVD’s for better control. With his strong accent, Thomas has taught drummers around the world skills that range from beginner, to very advance stick and foot control. Like I said before, Thomas is not only a great drummer, but a talented guitarist and producer as well. With so many achievements under his belt, he is definitely a notable drummer. Thomas Lang was born in Austria on August 5, 1967. Like most professionals, he started playing the drums at the age of 5. Years of drum lessons and practice brought this young and upcoming drummer along very well. Thomas Lang was the youngest student to be enrolled at the Vienna Conservatory of Music. Here he learned all different styles of music like Jazz, Classical, Fusion, and big band. Upon graduation, Thomas immediately began working with many different bands and artists in Europe. He engulfed himself in work, sometimes doing up to 15 projects at a time. Eventually, Thomas grew a name for himself. Thomas Lang’s aspiration in life is to be able to “play the unplayed”. This has been his life slogan he has lived with ever since he was young. As he progresses through his music career, this aspiration becomes more and more achievable. Some of the reasons for this are his grueling practice schedule. Lang practices a set routine every day (or at least tries to). These practice exercises eventually became the basis to his 1995 video called “Ultimatives Schlagzeug I & II”. This sold so many copies, that it was eventually re-released in 2004 by Hudson music. Thomas not only plays the drums, he creates them. He works closely with Meinl cymbals to create new and improve sounding cymbals. In 2002, Lang created the “Toms Becken”, a line of cymbals that both acoustic and electronic drummers could use. These grew more and more popular in time that eventually Lang created the “Fast Hats”. In addition to all of this in 2002, Remo and Meinl got together with the help of Thomas Lang to create the “Thomas Lang Practice Kit’. This is a complete practice pad set that looks similar to a drum set - perfect for traveling with. Here are some Thomas Lang pictures if you are interested in seeing him and his setup. 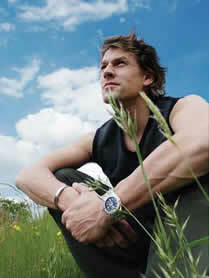 Currently, Thomas Lang is signed with Sonar and Meinl. For his drum set, he plays a Sonar X-ray acrylic kit, with Remo drum heads. His drum set is very large, with 2 22 inch bass drums, 2 snares and a wide array of toms. In his recent DVD, he uses multiple pedals for snares, bells, and other toms for different effects. He uses Vic Firth drum sticks, and Gibralter hardware. He has a wide array of Meinl cymbals, including his own cymbals he has created. He also uses the Roland TD-20 electronic drum set. He uses this in a variety of live performances, as well as his latest DVD – Foot Control. Thomas Lang currently lives in Los Angeles with his wife and 2 sons. He recently released a video with Hudson music called “Total Foot Control”, and practices regularly in his home studio. He is currently working on a solo album that is due to be released early this year called “Along These Lines”. So as you can see, Thomas Lang is much more than a drummer, he is a musician, complete with his own albums, hardware, and cymbal line. If you are interested in learning more, be sure to check out this Thomas Lang bio. If you want to see some videos of Thomas Lang check out the drum videos website. Famous Drummer Videos - Do you want to see your favorite drummers in action? Visit our new drum website! Here you will be able to learn everything you need to know about famous drummers and also learn how to play the drums with our online video drum lessons. Add Spice And Creativity To Your Drum Beats - Tired of playing the same old beats? Sometimes as drummers we just need some fresh ideas to mixing things up. In this lesson, I hope to provide you with some tips and suggestions to fill your creativity toolbox. Save Valuable Practice Time With These Tips - These tips apply to any drum book, so keep them in mind no matter what you are studying. I might repeat some things that are already written in drum books, but I want to make sure all the important things are covered here. The Importance Of Drum Rudiments - Drum Rudiments are the most important aspect to drumming. They are the fundamentals to all percussion, and should not be ignored. Learn some of the pros and cons of practicing your drum rudiments.